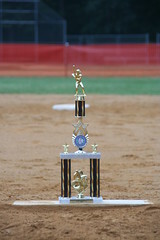 The TAA 8U's took one on the chin tonight, losing to arch-rival Medford in the Pinelands Classic Championship game. John was 0-1 with a walk and run scored, but struggled at the plate for the second straight night. The night started well as I was officially inducted in The Blue Cup Club and the skies brightened just in time for the first pitch. Medford kept the TAA big bats quiet though and the visitors touched TAA pitching for a big inning that effectively finished the game. Last night was tough too, as John took the collar and felt very bad after leaving 2 teammates on to end the game. Tears were in his eyes as we left the field last night, which was tough for me to watch. He made me proud when he bravely accepted the kind words of the Southampton coach after the game, but I was silently wishing he didn't have to learn just yet how tough a game baseball can be. New friend and Blue Cup Club president Rob Duff put things into perspective for me though, reminding me how lucky I was to be watching my son play on this team at all. He's right. These kids are working hard and have improved a great deal in the last month. Photos from tonight's game are up. I'll have the Southampton game up tomorrow. Thanks to all the coaches for their hard work with the boys, all the dads for their tireless efforts on the fields and to all the moms for keeping us fed and hydrated. I'm off to ice my knee. AJ got me good tonight! Even though it's tough, it's how the game goes. You are a good dad and your boy is a good boy. Bravo to both of you for learning life's lessons from the game.